Steelers Chairman Dan Rooney, 'One Of The Finest Men' In NFL History, Dies At 84 : The Two-Way During Rooney's time steering the team his father founded, the Pittsburgh Steelers reached the heights of the NFL. Off the field he also spearheaded efforts to diversify the league's hiring practices. 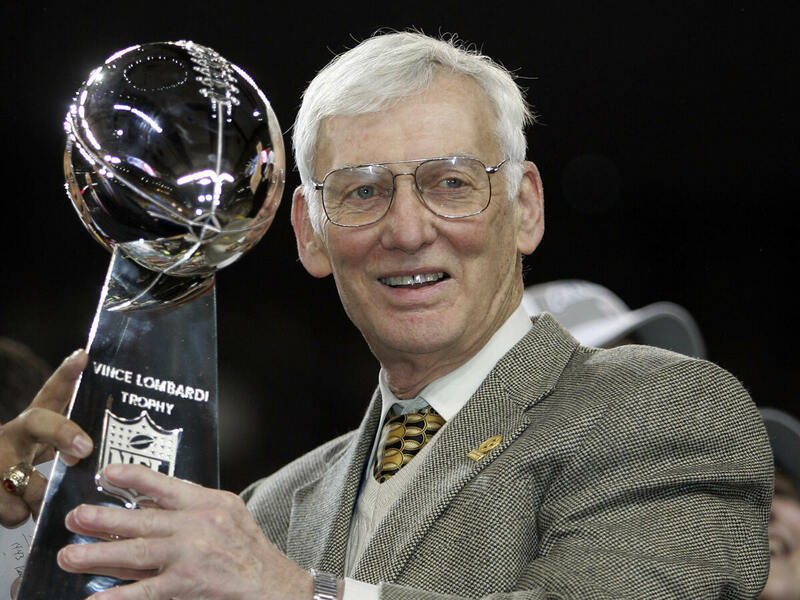 Steelers owner Dan Rooney lofts the Vince Lombardi Trophy after Pittsburgh beat the Seattle Seahawks to win Super Bowl XL in 2006. Dan Rooney, who steered the Pittsburgh Steelers for decades and helped spearhead the NFL's efforts at diverse hiring, has died at the age of 84. The team announced his death Thursday. "Few men have contributed as much to the National Football League as Dan Rooney," NFL Commissioner Roger Goodell said in a statement. "A member of the Pro Football Hall of Fame, he was one of the finest men in the history of our game and it was a privilege to work alongside him for so many years." For decades Rooney took the team his father founded and guided it to the very heights of the NFL, winning a league-best six Super Bowls. The Steelers most recently won it all in 2009. But, just as the Steelers were not born a powerhouse, Rooney himself didn't begin his career with the team at the top of the franchise. "My father [Art] would take me to the training camp — and I went to the training camp before I was 5 years old," Rooney once recalled. "And he was not a doting father, that he was going to watch me. He would let the players take care of me." He would take his homework on team trips as a child, and USA Today notes that his first official job with the team was water boy. He eventually took over day-to-day operations for the franchise in 1975, holding onto them — first with his father, then on his own — for nearly three decades until he passed them on to his own son, Arthur Rooney II, in 2003. But he remained a constant presence with the club long after that. "When we first met in 2010 you embraced me with open arms," Steelers' star wide receiver Antonio Brown said in a note dedicated to Rooney on Instagram. "You made me feel welcome. You looked at me as more than just another jersey number. One of the most genuine, and humble human beings I've had the pleasure of knowing." Yet, as the Pittsburgh Post-Gazette reports, Rooney left a mark not simply on the Steelers but on the league as a whole, as well. "He fought to give more opportunities for minority coaches to ascend in the NFL," the paper writes, "an effort that prompted the adoption of what is known as the Rooney Rule, which requires teams to interview at least one minority coach in the process of hiring a head coach." And ultimately, for Rooney, it was about opening doors for people of skill — of all races — to further the game that he loved. "We are not here today to celebrate statistics," Rooney said on the day he was enshrined in the Hall of Fame. "We are here to celebrate excellence and the accomplishment of people reaching a level, collectively, to be the best they could be: Men of character helping each other to reach the heights of human achievement." A previous version of this story referred to Dan Rooney's son, Art Jr. In fact, Rooney's son is known as Arthur II; Rooney's brother is known as Art Jr.